The Cardinals lost some veteran blocking along the line but don’t find themselves with an empty offensive cupboard in the least. Evan Mathis was only able to play 199 snaps for the Cardinals and while Earl Watford did play 788 snaps he didn’t grade out well for the Cardinals (and with only a 92.8 pass blocking efficiency and a pass blocking grade of 29.0). Now younger players on the roster should see those snaps. The Cardinals top offensive skill players all return and the lost snaps along the line should be easy enough to replace. Likely replacement: Evan Boehm– G – 52.7 grade. The Cardinals spent a fourth round draft pick on guard Dorian Johnson and a fifth round pick for tackle Will Holden in the 2017 draft and while they likely won’t start the rookies they have other young offensive linemen waiting in the wings. In 2016 the Cardinals used a fourth round pick on center Evan Boehm and a fifth round pick on tackle Cole Toner. 2015 first round pick D.J. Humphries will be entering his third season and expected to make a big improvement as a pass protector, as his PBE of 93.4 ranked 43rd out of 61 qualified tackles last year. The Cardinals lost some talented defensive players in free agency. Kevin Minter takes his run-stuffing ability to Cincinnati (4.6 run stop percentage, 36th in the NFL among inside linebackers), which thinned out the linebacker group. Calais Campbell’s loss to Jacksonville will sting as he was a stalwart on the defensive line (his 90.4 grade ranked second among defensive interior players) as well as a leader off the field. Tony Jefferson is finally getting the money his play has merited with the Ravens, as he finished with the eighth-highest safety grade last year. The silver lining for the Cardinals is that the size of at least one the free agent contracts of these lost players should result in them receiving a compensatory draft pick. Arizona’s plan to replace their lost snaps on defense is to plug in younger home-grown talent rather than go on a large free agency spending spree. The Cardinals’ front office had been preparing for the departure of Calais Campbell awhile now and spent a 2016 first round pick on Robert Nkemdiche to serve as his eventual replacement. Expect a big jump in playing time and production for Nkemdiche in his second-year, where he should improve upon his 3.5 pass rushing productivity statistic, the Pro Football Focus rating that measures pressure created on a per snap basis with a weighting towards sacsks. 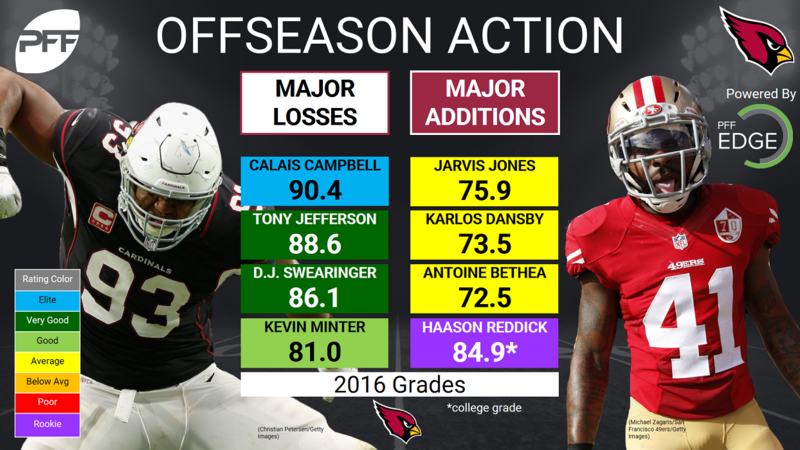 The Cardinals lost considerable snaps at safety with the departures of Tony Jefferson and D.J. Swearinger but added back to the position by selecting Budda Baker in the second round of the 2017 draft. The lost snaps of Kevin Minter should be immediately replaced by rookie first round pick Haason Reddick or the veteran Karlos Dansby, who’s run stop percentage last year was 9.8. Center Tim Barnes fled to the rival 49ers, taking his 96.0 PBE with him. The Rams traded their former No. 2 overall pick Greg Robinson to the Lions for an undisclosed 2018 draft pick, finally closing that chapter and hopefully things work out well for both the Rams and Robinson. Lance Kendricks left for Green Bay in free agency. Kendricks had the worst drop rate among qualified tight ends in 2016 at 12.28. The Rams replaced the lost snaps at center by signing John Sullivan in free agency. They’ll saw a major upgrade at left tackle with the addition of Andrew Whitworth to protect the outside for QB Jared Goff. Whitworth was PFF’s second highest graded tackle last year, and Sullivan’s grade was a slight improvment over Barnes’. 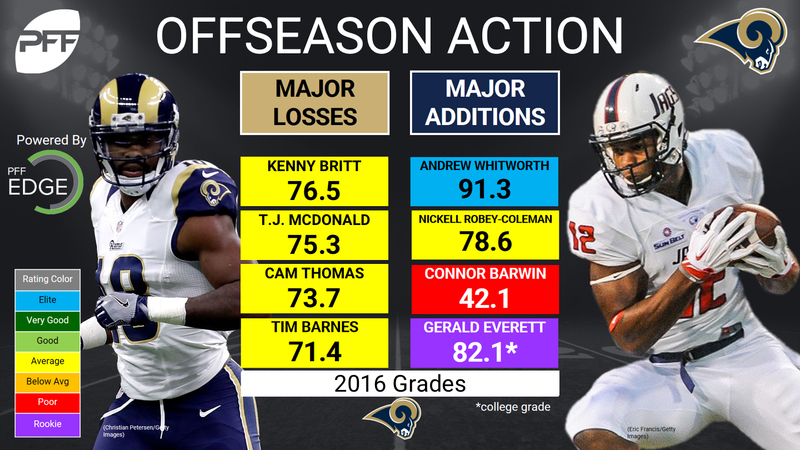 The additions of Sullivan and Whitworth should help increase the amount of time Goff has to throw in 2017. Lance Kendrickks’ 830 snaps will likely be filled by rookie Gerald Everett, who was head coach Sean McVay’s favorite player in the draft class. Robert Woods was signed in free agency to be the Rams’ primary wide receiver. Third round pick Cooper Kupp should see significant snaps as a rookie and should emerge as Goff’s primary target in the slot. Kupp had the third most routes ran out of the slot in the nation in 2016 and had the sixth highest catch rate out of the slot. The biggest loss for the Rams on the defensive side of the ball is represented by the departure of T.J. McDonald’s 1072 snaps to the Miami Dolphins. McDonald was the 19th ranked safety in run stop percentage last year at 5.2%. The lost snaps of Eugene Sims and Cam Thomas can both be plugged with new pieces but the defense will also be operating a new scheme under Wade Phillips. The Rams plan to replace T.J. McDonald’s snaps by shifting some existing pieces on their roster. Maurice Alexander who played both free safety and strong safety last season will likely be directing replacing McDonald’s snaps at strong safety. Lamarcus Joyner is moving to free safety but will likely get moved around in sub packages. The signing of Nickell Robey-Coleman also adds another defensive back to the mix who can play in the slot in addition to the versatile Joyner. The aptly named Nickell was fourth in the NFL in cover snaps per reception allowed among qualified cornerbacks, allowing a catch only once per 13.0 slot cover snaps. While Barwin hasn’t been very productive he does have familiarity with coach Wade Phillips defense and should be a “plug and play” veteran, who along with frenetic rookie Samson Ebukam can replace the lost 536 edge snaps of Eugene Sims. Rookie sixth round pick Tanzel Smart should be able to replace the snaps lost by the departure of Cam Thomas if more established veterans can’t fill the void. Smart was seventh among qualified college defensive tackles last year in PRP, coming it at a mark of 9.9. The 49ers effectively cleaned house at quarterback losing a combined 1,028 snaps at quarterback between the available free agent Colin Kaepernick and Blaine Gabbert who is currently in a battle to be the backup to Carson Palmer in Arizona. Torrey Smith signed with the Eagles. The 49ers are replacing those lost snaps at quarterback with the addition of Brian Hoyer as a veteran who knows new Head Coach Kyle Shanahan’s offensive system as well as with the rookie C.J. Beathard, who was effectively hand-picked by coach Shanahan in the draft. While Beathard was only 69th in the country in quarterback rating last year, he was in the 22nd ranked quarterback in adjusted completion percentage. The free agency acquisition of veteran wide receiver Pierre Garcon should replace a good portion of the lost snaps of Quinton Patton and Torrey Smith. Garcon was 21st among qualified wide receivers in wide receiver rating last year. Rookie Trent Taylor could also see some reps in 2017. The 49ers lost considerable snaps at linebacker between Nick Bellore, Gerald Hodges and Michael Wilhoite. Additionally the lost quite a few snaps in the secondary as well with the release of Tramaine Brock and the departure of Antoine Bethea to the NFC West rival Cardinals. Bethea was 16th in qualified safeties in run stop percentage (5.8%) and 12th in tackling efficiency last year. The 49ers look to be turning to younger players to fill their lost snaps on defense. The addition of hammering rookie linebacker Reuben Foster will more than compensate for the losses felt at the linebacker position. Foster will likely play middle linebacker but possesses the ability to play weak-side linebacker as well as in sub packages. 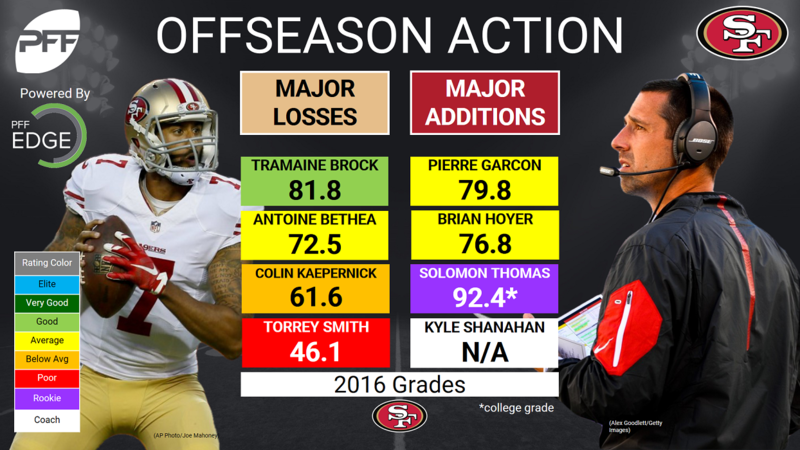 Rookie first round pick Solomon Thomas can be moved up and down the line and dominate against the run and the pass which will more than make up for lost snaps from Glenn Dorsey. Thomas was PFF’s third ranked edge defender in the 2017 NFL draft. Second-year cornerback Rashard Robinson or rookie Ahkello Witherspoon will likely be called upon to replace a large portion of lost cornerback snaps. Jimmie Ward was asked to move back to his natural position of safety and if healthy should be the 49ers centerfielder. As a cornerback last year, Ward allowed a catch per eight cover snaps last year, 99th out of 117 qualified cornerbacks. The largest loss of snaps on the offensive side of the ball was felt when tackle Garry Gilliam left to go to the 49ers. Bradley Sowell left to sign with the Bears leaving the Seahawks a bit thin at the tackle position. Neither player graded especially well and neither had a pass blocking efficiency above 93.3. 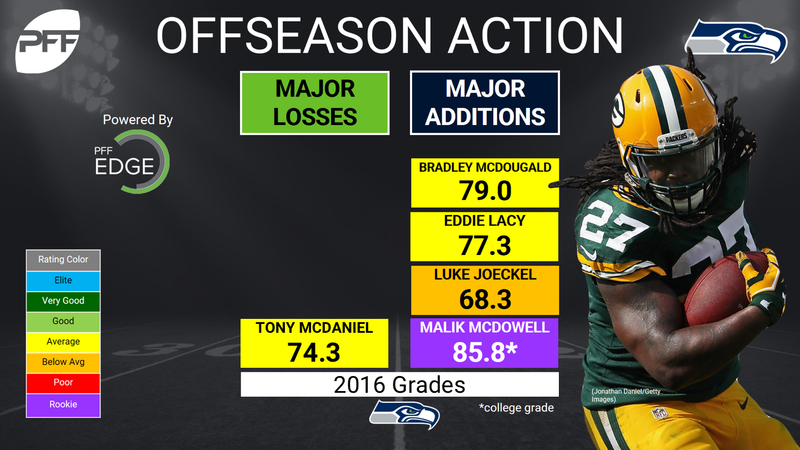 The Seahawks are looking to replace their lost tackle reps through a combination of the emergence of George Fant and second-year player Germain Ifedi. Both players will need to improve noticeably as pass protectors to give Russell Wilson more time to operate. Fant had a 32.7 pass blocking grade last year and Ifedi had a 29.0 pass blocking grade last year. The Seahawks also drafted the versatile Ethan Pocic who can play any spot along the offensive line and might be a natural fit at tackle. The Seahawks appeared to make an effort to get younger at safety by letting Steven Terrell and Kelcie McCray leave and then drafting 4 defensive backs. Tony McDaniel signed a contact with the New Orleans Saints, taking his 10.2 run stop percentage and his 2.8 PRP with him. Free agent Bradley McDougald should go a long way toward replacing the backup safety reps lost. Additionally, the Seahawks drafted ball-hawking safety Tedric Thompson as a player who can play in the middle of the field for them. The Seahawks also spent a late draft pick on Michigan safety Delano Hill. The plan was that rookie Malik McDowell would be able to play significant snaps along the defensive line but he suffered a non-football injury and his immediate future is uncertain.